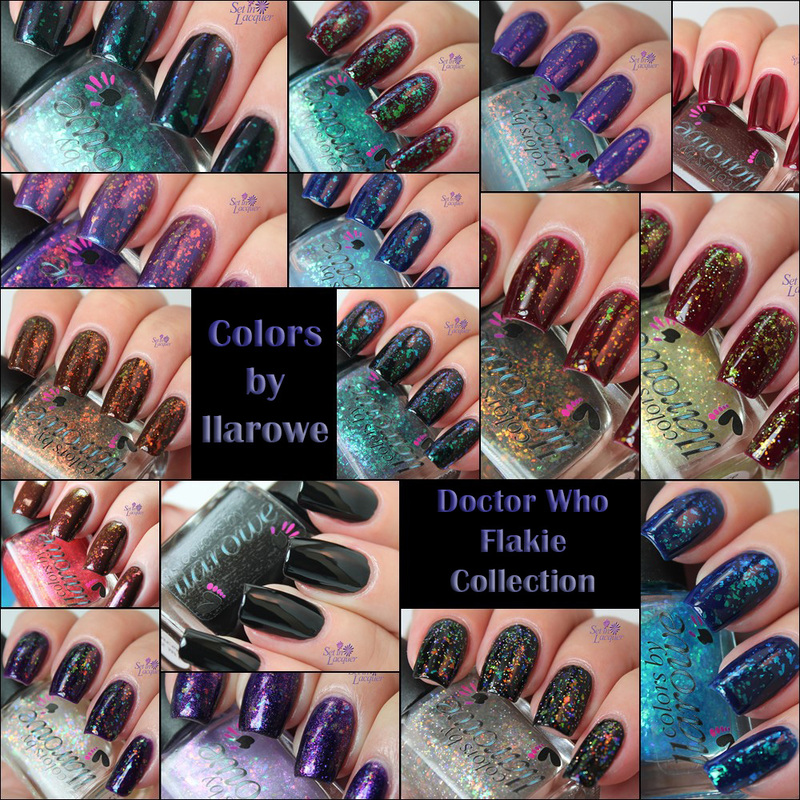 Today's post is a fun, flakie-filled collection from Colors by llarowe - The Doctor Who Collection, Part 1. I am excited to be able to share this collection with you. There are 14 flake polishes, a jelly and a creme polish. I watch Doctor Who, but I am not a die-hard fan. 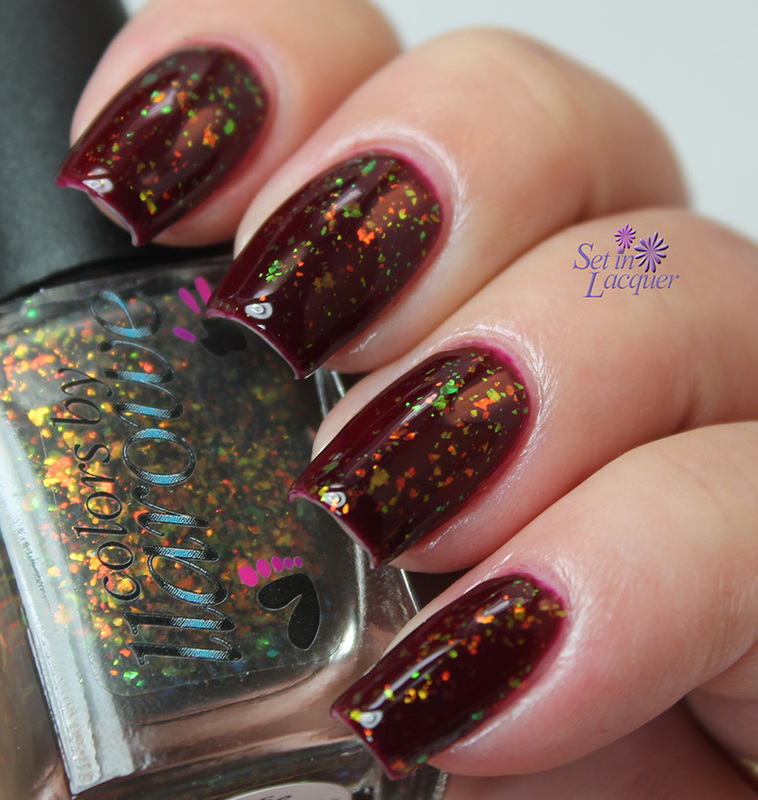 But these polishes and the names are a bit subjective, but are an honor to the show and its characters. Let's take a look. There are a ton of photos for you to see and don't forget - if you want to see a larger photo - just click on the image. All of these are shown with a top coat. 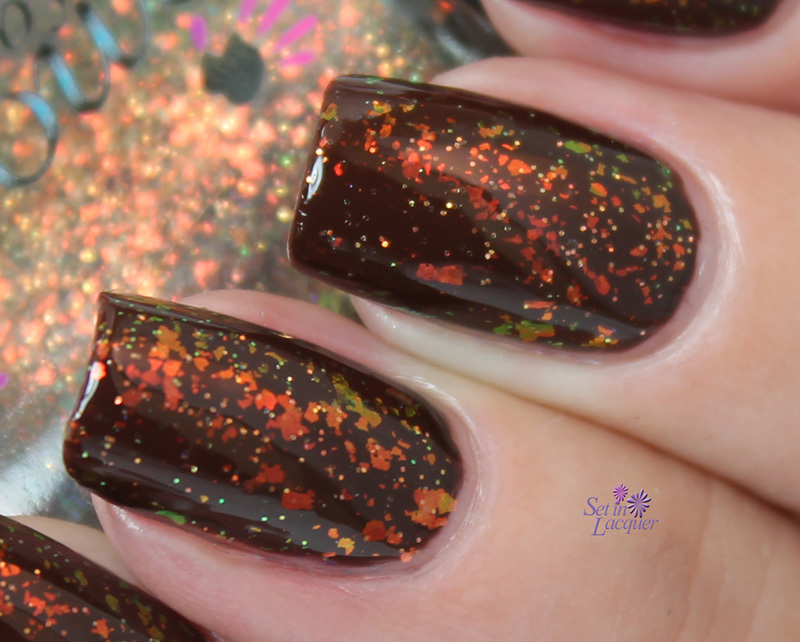 The flakes aren't shy and apply quite easily and they rest flat against the nail. 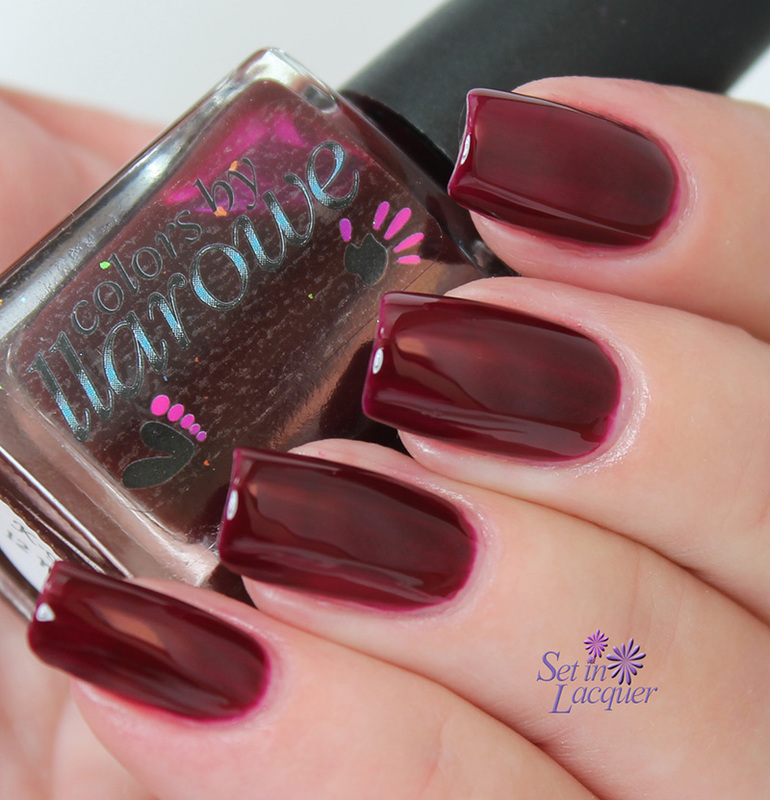 K-9 is a rich oxblood red jelly polish. 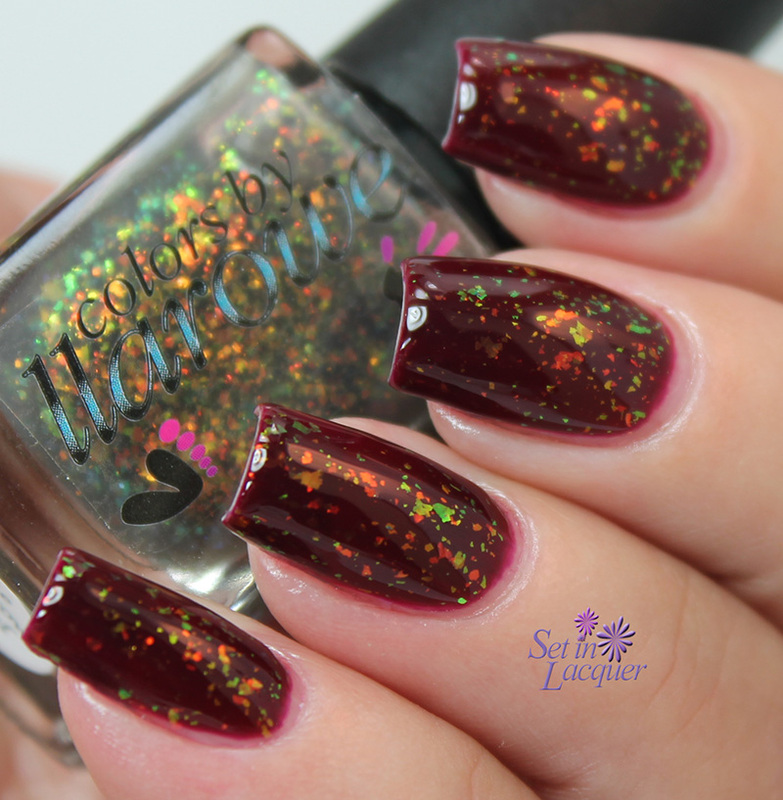 It's perfect to use by itself, as a base for the flake polishes or to use to create a jelly sandwich with glitter or flake polishes. This is four coats with a top coat. Make sure to wear a base coat to protect your nails from any staining. I had just the slightest (very slight) bit of color left behind. Vincent is a black creme polish. It could easily be a one-coater and the high-gloss finish is stunning. I used two coats for these photos though as the camera can be quite harsh. 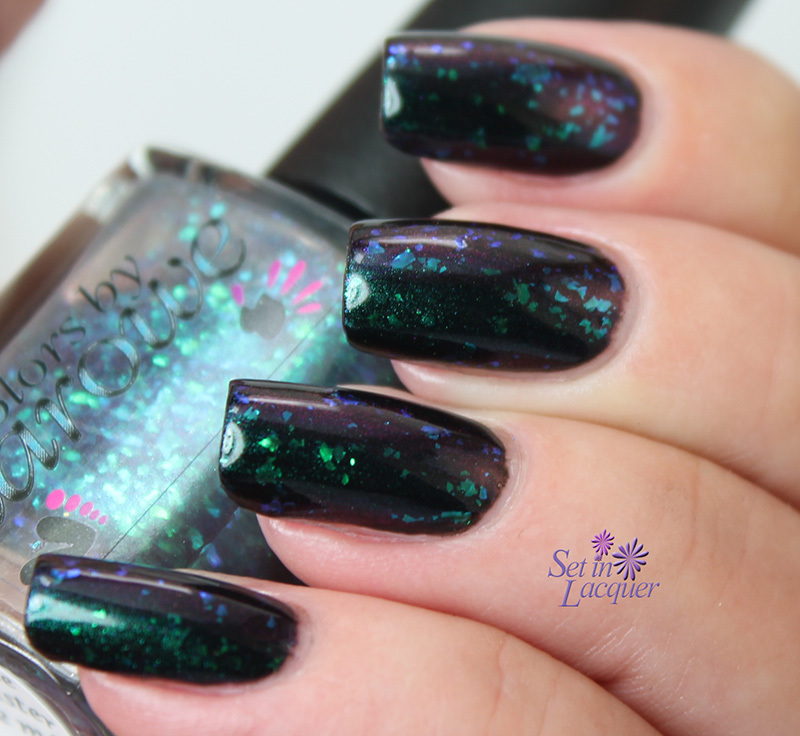 I seriously need a never ending supply of this gorgeous black creme polish. 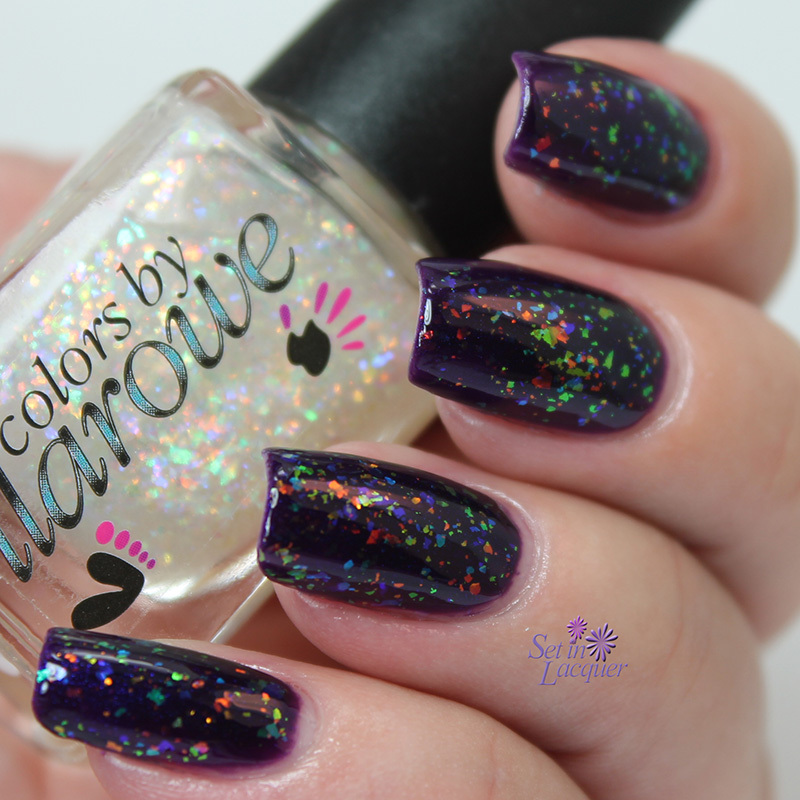 Madame Vastra (shown over Cbl Grace) has flakes that shift from a red, to yellow, to green. There's even a bit of rich orange showing. It is in a purple tinted sheer base. It can be used on its own with several coats. 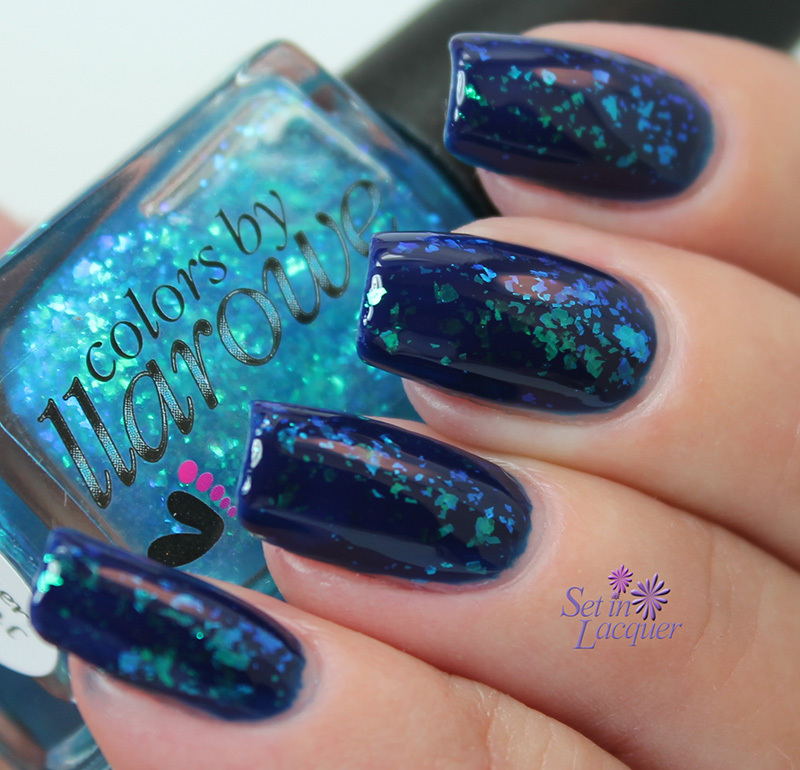 River (shown over Fancy Gloss "My Sailor") has sapphire blue to green flakes. 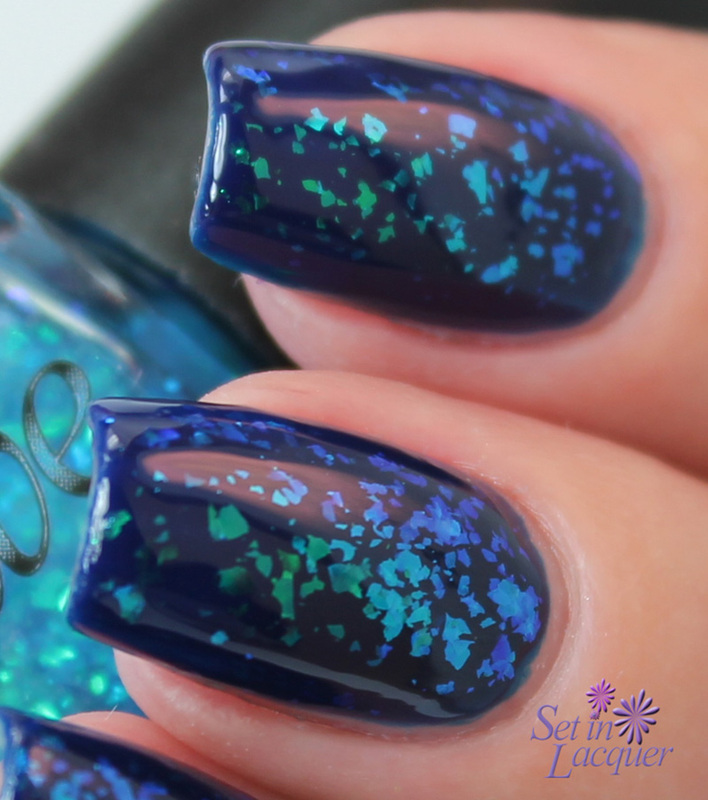 The shift is gorgeous and it looks completely stunning over the Fancy Gloss deep blue polish. 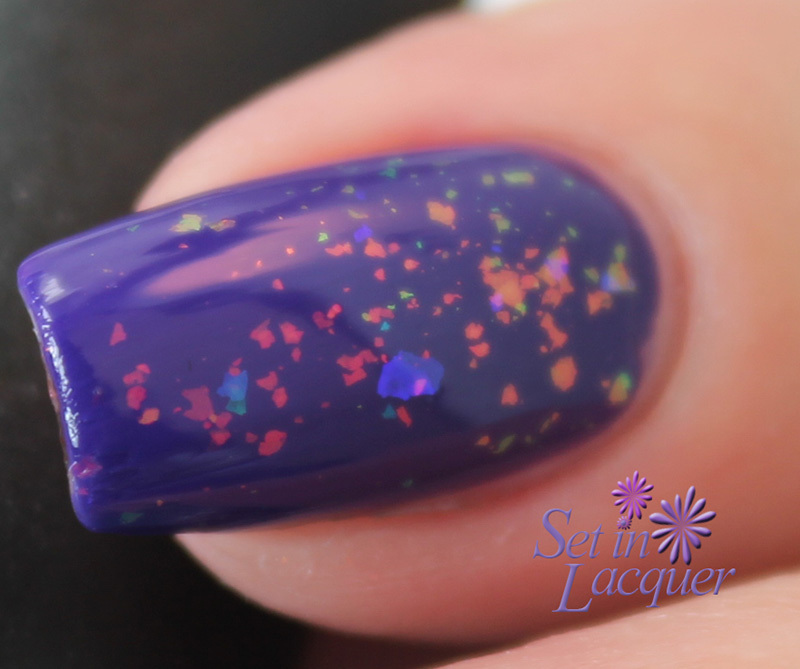 The flakes swim in a blue tinted base. 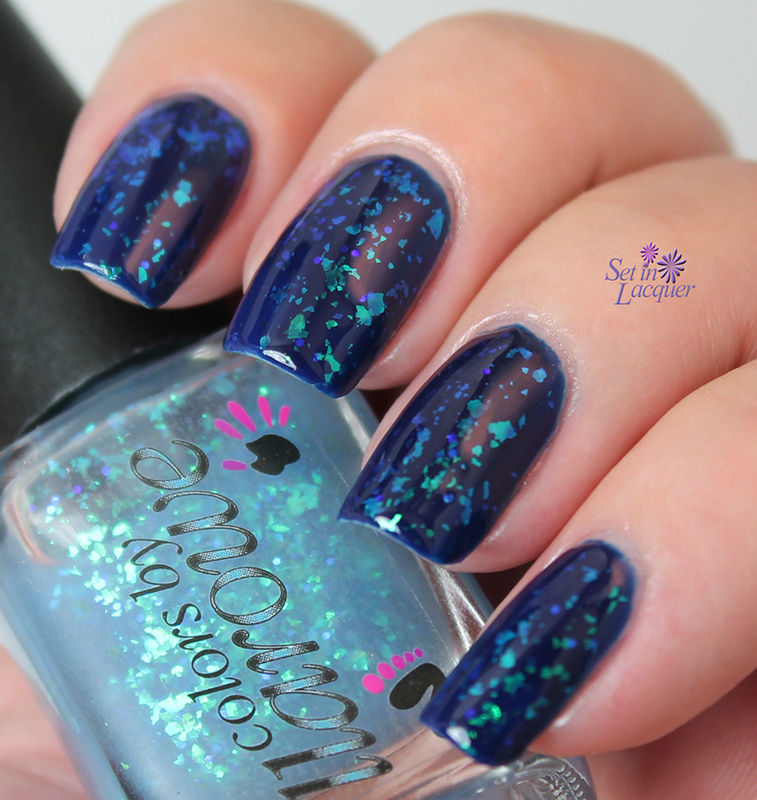 Mickey (Shown over Vincent) has flakes that shift from teal green to blue in a clear base. 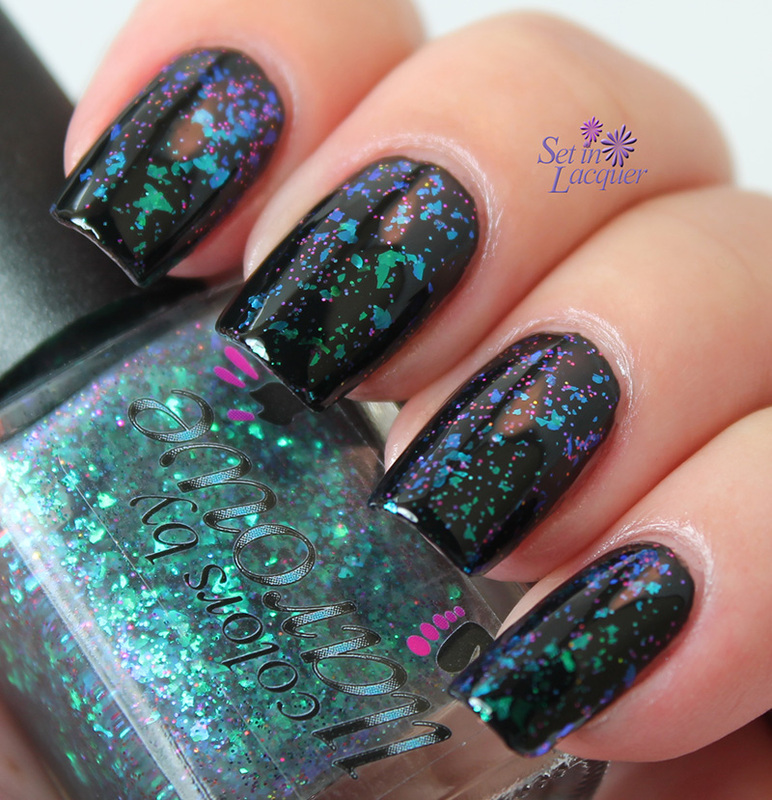 It also has purple to blue to green multi-chrome and green to purple micro-glitters. Amy (Shown over K-9) has flakes that shift from green to teal. 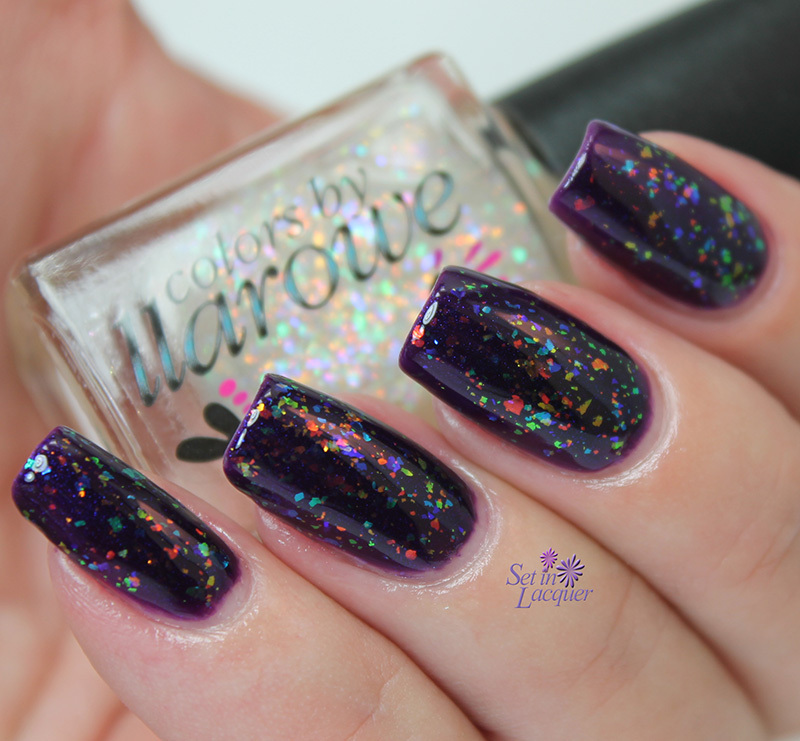 It also has purple to green micro-glitters. The flakes and micro-glitters are suspended in a soft teal blue base. 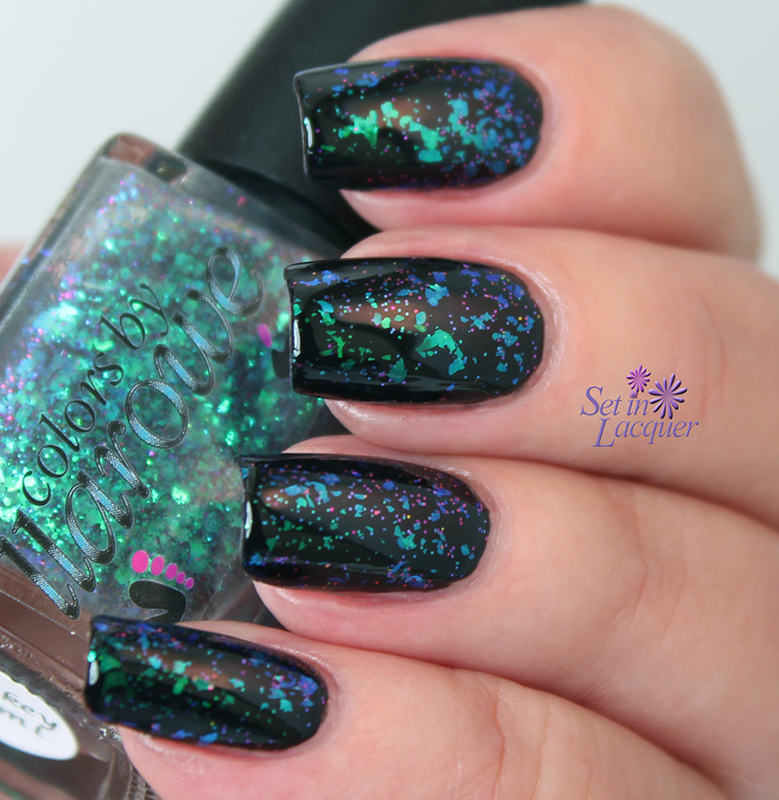 Jackie (Shown over Fancy Gloss "My Sailor") has flakes that shift from blue to green. They are suspended in a clear base. I love this color combo. Blues and greens together are one of my favorites. 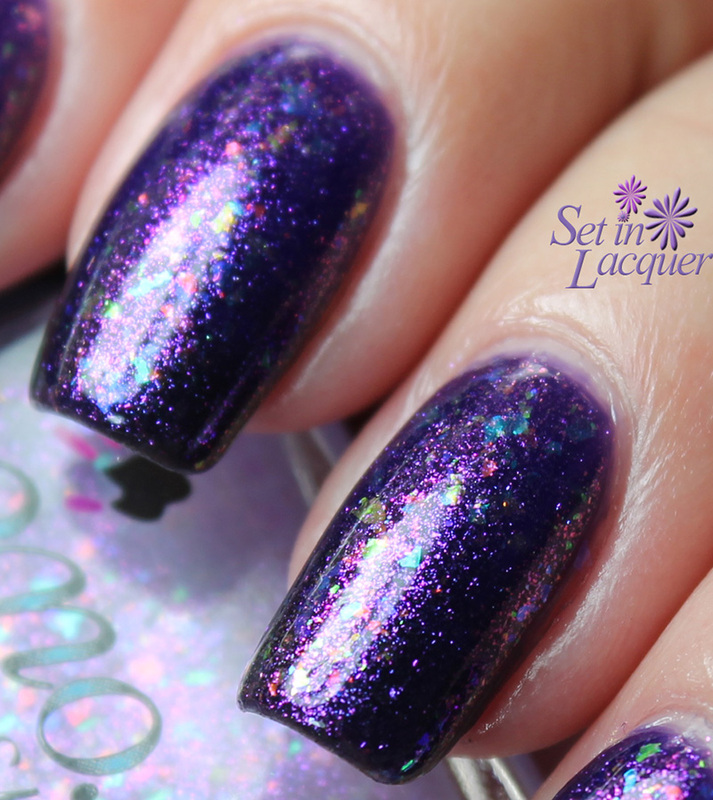 Davros (Shown over CbL "Purple Rain") is a complex flake polish. It has multi-color flakes that are suspended in a clear base. The colors complement each other well. The Eyebrows (Shown over K-9) has flakes that shift from red, to copper, to yellow, to green and are suspended in a slightly black tinted base. 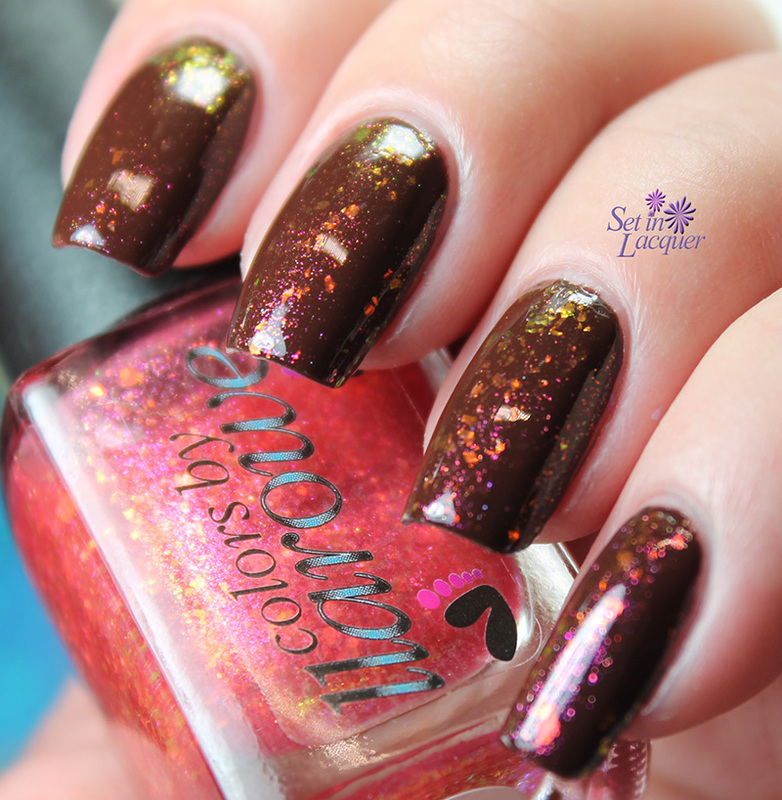 Revitalize your current mani with a top coat of this mesmerizing flakie top coat. The Master (Shown over CbL "Vincent") has flakes that shift from blue to green that are suspended in a clear base. 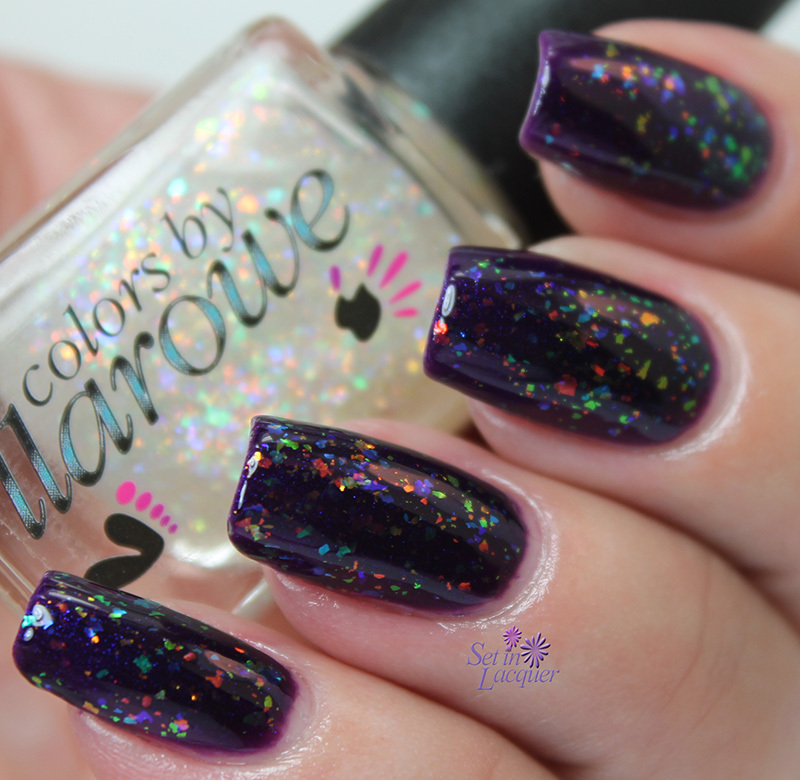 This polish also has the addition of green to purple multi-chrome, which gives it a litt-e more oomph. 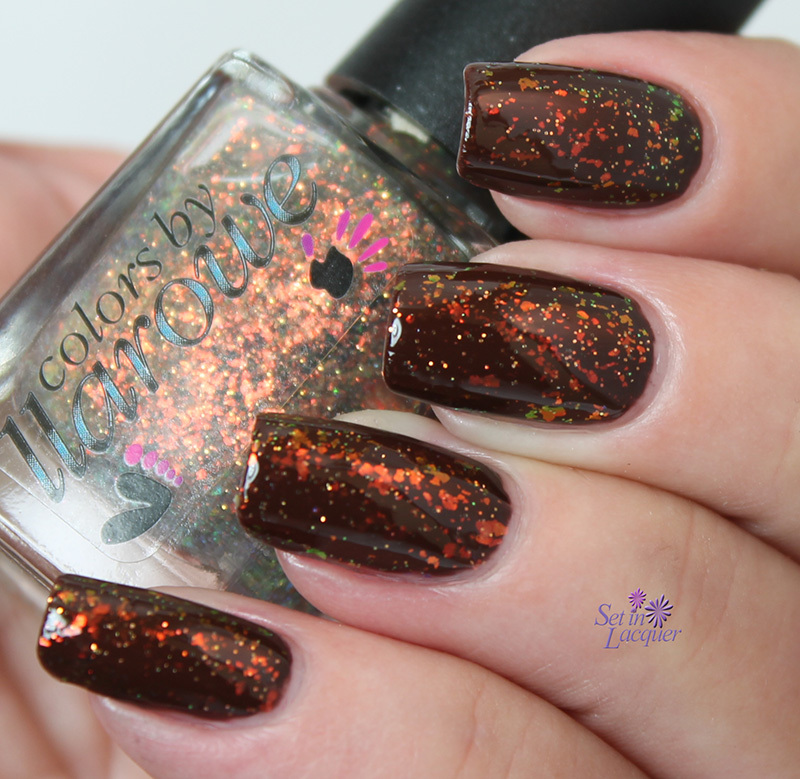 Mine is Nine (Shown over Fancy Gloss "Dark Chocolate") has red to gold shifting flakes suspended in a clear base. 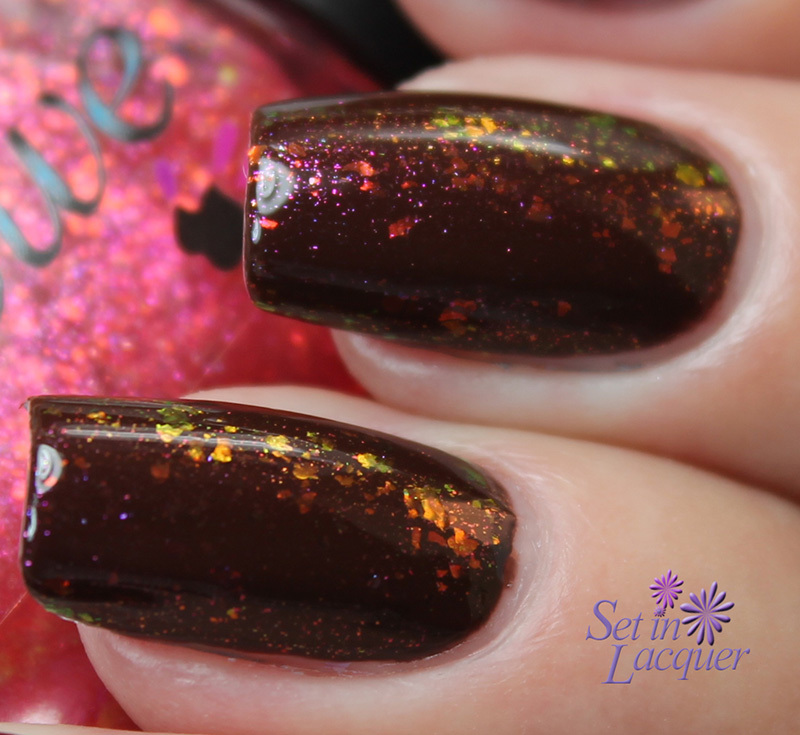 Red to gold shifting shimmer add a little extra glitz and shine. The Ood (Shown over Fancy Gloss "Dark Chocolate") has red to yellow shifting flakes in a reddish pink base. It has added copper shimmer. But there is an amazing pink shimmer in there that is subtle, but completely mesmerizing. Face of Boe (Shown over CbL "Vincent") has vibrant green to yellow flakes with a healthy spritzing of yellow and orange holo glitters. 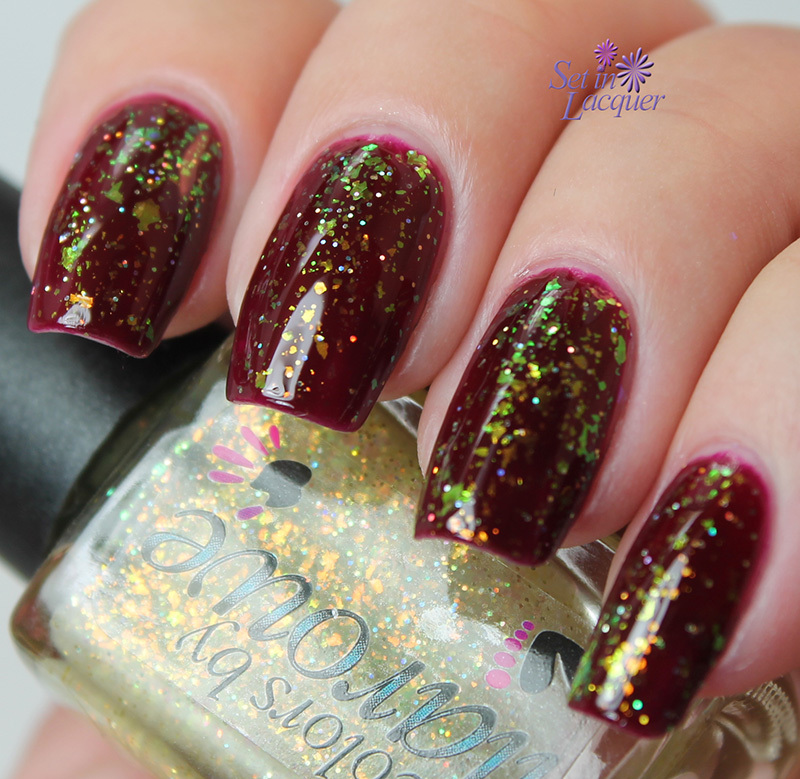 Look at that shimmer! 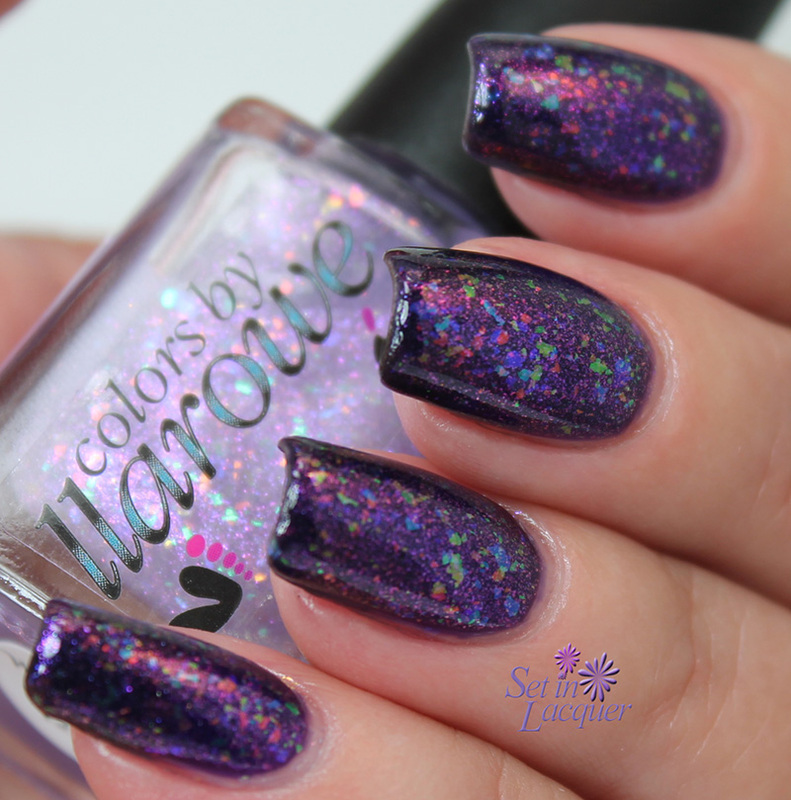 Weeping Angels (Shown over a gradient of CbL Vincent and Grape Juice) has tons of multi-color flakes and added plum and golden shimmer. It's not a shy flakie - It wants to be out there! Don't blink! 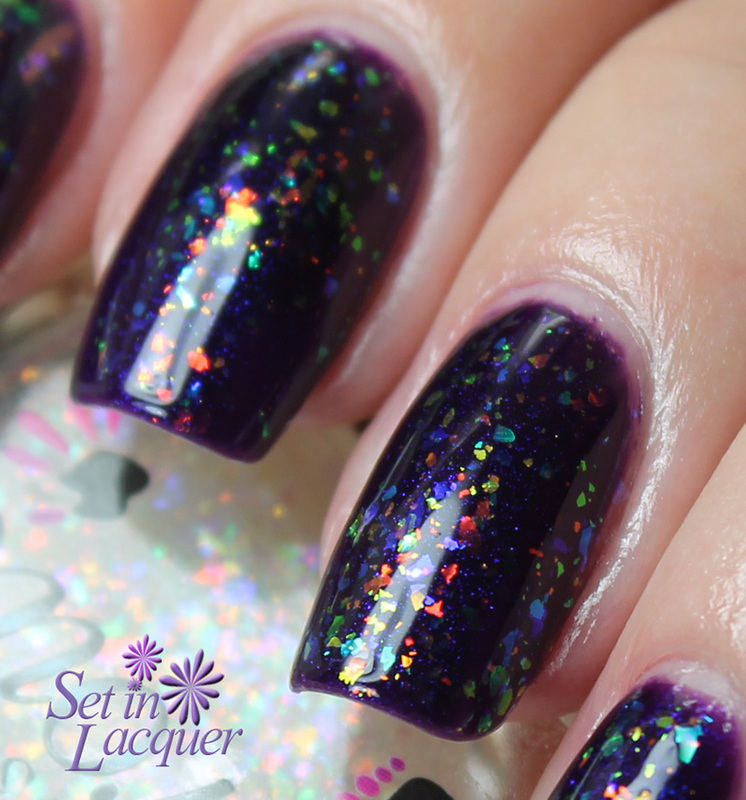 Ten is Tops (Shown over CbL "Vincent") is chocked full of multi-color glitter with a liberal addition of holographic glitters. 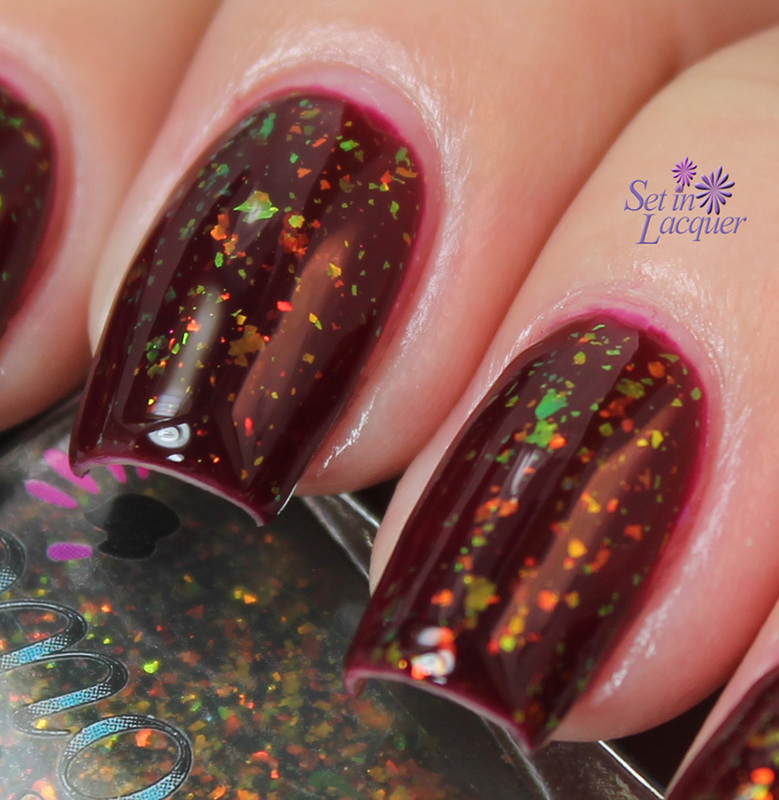 Allons-y Alonzo (Shown over OPI Do You Have this Color in Stock-holm) has red to copper to green flakes and then - just to keep you on your toes - a small addition of multi-colored flakes. These flakes are suspended in an aqua tinted base. 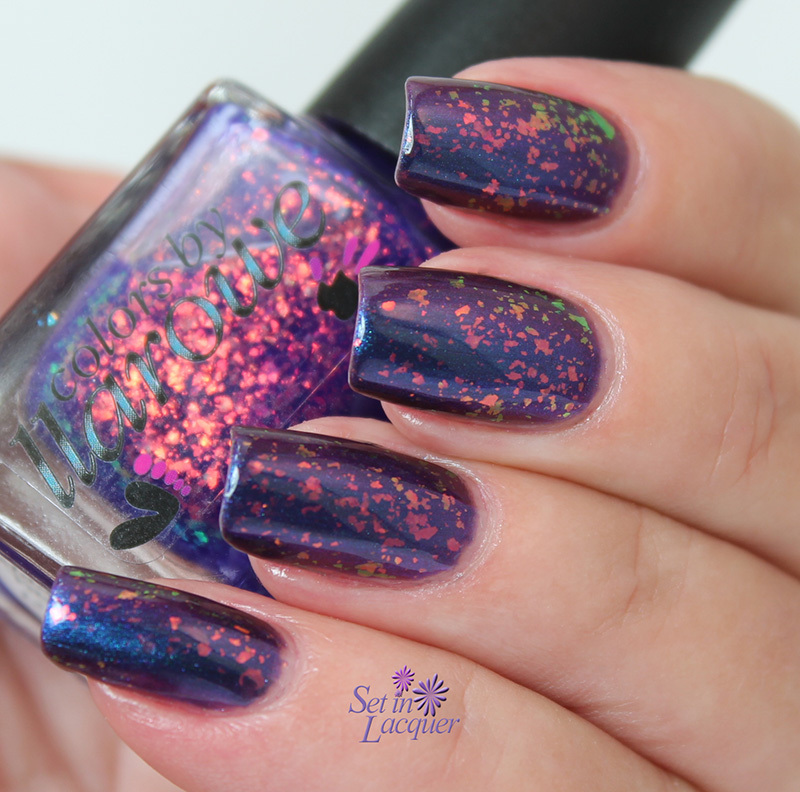 These intense flake polishes are gorgeous. Some are similar to one another and you will have to decide whether you want just flakes or one with added glitter or glitz. Can't decide? Get them all! The Doctor Who, part 1, Collection can be purchased on December 15, 2014 at llarowe.com. 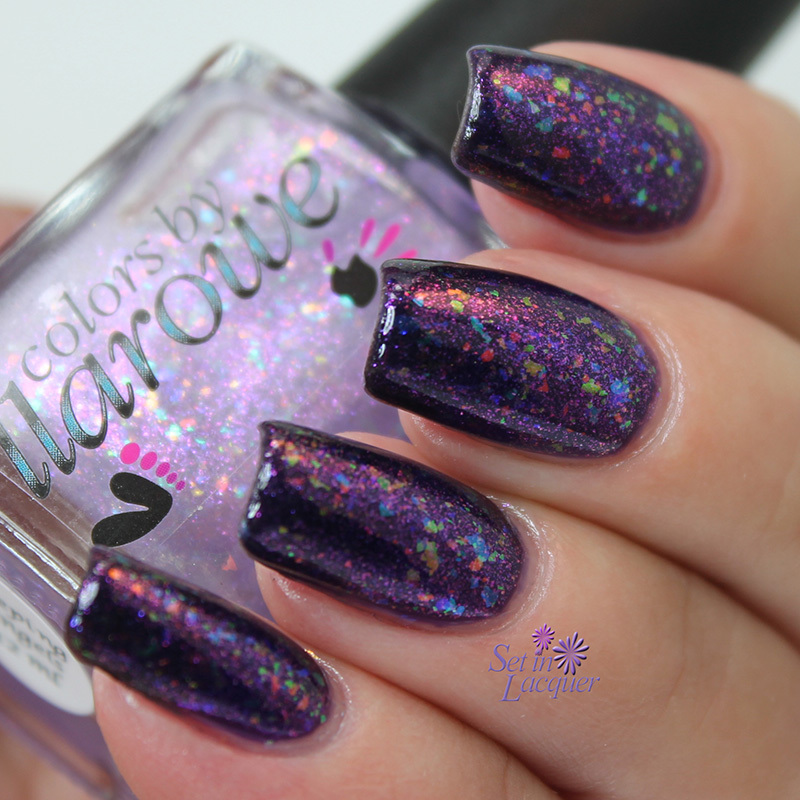 Follow llarowe on Facebook and Colors by llarowe on Facebook to keep up with new collections, releases and specials.